An e-card is an updated version of traditional paper greeting cards. When you send an e-card, the recipient receives an email containing a link to the card. Selecting the link allows the recipient to view the card, which may contain music or animation. Sending an e-card is easy and can also cost nothing! Someecards offers thousands of free e-cards, which tend to be designed for adults and each of which contains a sarcastic or tongue-in-cheek quote. These sassy quotes, which are accompanied by simple drawings, makes the website one of the best places to obtain a free e-card. Occasions for which free cards are available include apologies, congratulations, and friendship. You do not need to create an account or otherwise sign in to send an e-card for free from Someecards. Free E-Cards Online offers several funny e-cards designed for weddings, birthdays, and anniversaries. Cards are created by more than 70 different artists located worldwide and each contains intricate artwork. This makes each card unique and results in the website being one of the best places to find free e-cards. Cards can be sent without needing to create an account. 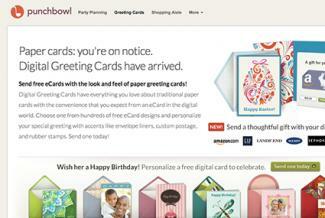 Punchbowl allows users to customize general thank you notes and holiday cards. The website is unique because it one of the few that offers thank you cards and because its cards are modern and somewhat simple. Personalization options include the font and content of a message, the envelope appearance, and the ability to include an electronic gift card. Punchbowl requires you to create an account to send its free e-cards. Cards can be customized with colors, messages, and inclusions, such as photos. You must register and create an account to send a free e-cards from Evite Postmark. 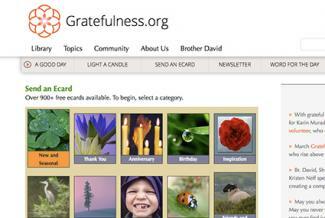 Gratefulness' free e-cards focus on honoring and expressing appreciation for the things in your life. Creating an account is not necessary to send a Gratefulness e-cards. 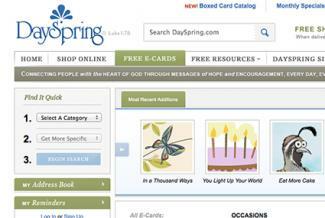 Cards cover topics like birthdays, inspiration, sympathy, and even humor. 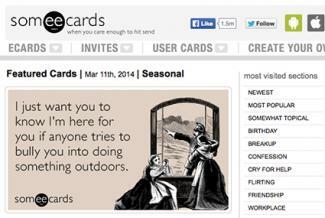 This website is one of the best places to obtain free e-cards because of the messages on its cards. Messages tend to be sweet, uplifting, short, and not religiously based. The free e-cards offered on Care2 eCards generate donations to nonprofit organizations when sent, making it one of the best places to obtain e-cards. Of particular note are the cards offering well wishes after or during an illness. You do not need to establish an account with the website to send one of its e-cards. The cards on 123 Greetings do not require an account to send. Its cards are designed for many different types of occasions, including anniversaries and weddings. Its smile cards, which features smiling faces, are particularly fun and a type of card that is rarely found on other sites, making this website a great resource for e-cards. 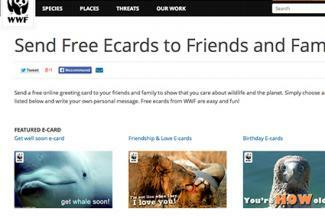 This association's cards feature photos of real animals, making it a wonderful resource for e-cards. Its cards are designed for occasions like birthdays and special occasions, such as wishing good luck. Announcement cards are also offered. No account is necessary to send an e-cards from the association's website. Soul Twins' cards feature animals on cards that are for general occasions. The photos adorning the card are of actual animals, and look as though you took them yourself. This makes the website's cards fun and the website one of the best places to obtain an e-card. You do not need to establish an account with the website to send its cards. Many allow you to choose an accompanying song and contain silly quotes. Most cards include Bible quotes along with fun sayings, making the website a great resource for e-cards. You may choose the date your card will be sent, allowing you to plan to send an e-card in advance of the day you wish it to be received. Day Spring does not require you to create an account to send a card, but doing so means allows you to create an address book and use those addresses when sending a card. Not all cards contain Bible quotes, allowing you to send a religious-themed card that merely reflects on God or offers encouragement. You can attach a special message to each card and chose the date it will be sent. The Christian e-cards offered by Crosswalk express sentiments such as sympathy and apologies, as well as focus on celebrations such as birthdays, anniversaries, and holidays. The website is unique in that it also offers scripture cards, a rarity among e-card websites. After creating your card, you may send it without creating an account on the website. Because they can be chosen and sent in a minute, sending an e-card is a great alternative to a paper card. With the numerous free cards out there, you don't have to spend money to make someone's day special.